The 1996 South African Constitution was promulgated on 18th December 1996 and came into effect on 4th February 1997. Its aspirational provisions promised to transform South Africa's economy and society along non-racial and egalitarian lines. Following the twentieth anniversary of its enactment, this book, co-edited by Rosalind Dixon and Theunis Roux, examines the triumphs and disappointments of the Constitution. It explains the arguments in favor of the Constitution being replaced with a more authentically African document, untainted by the necessity to compromise with ruling interests predominant at the end of apartheid. This book evaluates whether the new legislation introduced in Australia and the UK is, in fact, necessary, appropriate, and effective at dealing with the foreign fighters phenomenon. It will be of value to academics and students who teach, research, and study the ever-evolving area of anti-terrorism law and counter-terrorism policy and of interest to academic scholars and students in a number of fields including law, comparative politics and government, and terrorism and security studies. Vigorous debate exists among constitutional scholars as to the appropriate 'modalities' of constitutional argument, and their relative weight. Many scholars, however, argue that one important modality of constitutional argument involves attention to underlying constitutional purposes or 'values'. In Australia, this kind of values-oriented approach has been advocated by leading constitutional scholars, and also finds support in the judgments of the High Court at various times, particularly during the Mason Court era. Much of the scholarly debate on constitutional values to date, however, focuses on whether the Court should in fact look to constitutional values in this way, not the kinds of values the Court should consider, given such an approach. This book responds to this gap in the existing scholarly literature, by inviting a range of leading Australian constitutional lawyers and scholars to address the relevance and scope of various substantive constitutional values, and how they might affect the Court's approach to constitutional interpretation in various contexts. This is the new and seventh edition of this acclaimed and authoritative book on Australian constitutional law. Fresh material reflects the contemporary approach of the High Court including its emphasis on statutory interpretation as a tool of analysis in constitutional litigation.The book has also been fully revised and updated for major High Court and overseas decisions, including Wilkie v Commonwealth, Re Canavan, Brown v Tasmania, McCloy v New South Wales, Murphy v Electoral Commissioner, the Brexit Case and Plaintiff M68/2015 v Minister for Immigration. Australia's constitutional crisis of 1975 was not simply about the precise powers of the Senate or the Governor-General. It was about competing accounts of how to legitimate informal constitutional change. For Prime Minister Gough Whitlam, and the parliamentary tradition that he invoked, national elections sufficiently legitimated even the most constitutionally transformative of his goals. For his opponents, and a more complex tradition of popular sovereignty, more decisive evidence was required of the consent of the people themselves. This book traces the emergence of this fundamental constitutional debate and chronicles its subsequent iterations in sometimes surprising institutional configurations: the politics of judicial appointment in the Murphy Affair; the evolution of judicial review in the Mason Court; and the difficulties Australian republicanism faced in the Howard Referendum. Though the patterns of institutional engagement have varied, the persistent question of how to legitimate informal constitutional change continues to shape Australia's constitution after Whitlam. This volume addresses the relationship between law and neoliberalism. Assembling work from established and emerging legal scholars, political theorists, philosophers, historians, and sociologists from around the world – including the Americas, Australia, Europe, and the United Kingdom – it addresses the conceptual, legal, and political relationships between liberal legality and neoliberal economics. More specifically, the book analyses the role that legality plays in the dominant economic force of our time, offering both a legal corrective to scholarship in economics and political economy that has paid insufficient attention to legal ideas, and, at the same time, a political economic corrective to legal scholarship that has only recently turned to theorizing neoliberalism. It will be of enormous interest to those working at the intersection of law and politics in our neoliberal age. Australia does not have a bill or charter of rights, which means there is no comprehensive law that enshrines human rights in Australia – even though these laws are standard in the rest of the developed world. So what does this mean for the rights of Australian citizens? In this fully revised fourth edition of A Charter of Rights for Australia, George Williams and Daniel Reynolds show that human rights are not adequately protected in Australia, contrary to what many of us think. Using some pressing examples, they demonstrate how the rights of people at the margins of our society are violated in often shocking ways. Several states and territories have adopted their own charters of rights, or have a charter well underway. This book’s argument that the time has come to adopt a charter at the federal level is more urgent than ever. This book provides unique insights into the practice of democratic constitutionalism in one of the world’s most legally and politically significant regions. It combines contributions from leading Latin American and global scholars to provide ‘bottom up’ and ‘top down’ insights about the lessons to be drawn from the distinctive constitutional experiences of countries in Latin America. In doing so, it also draws on a rich array of legal and interdisciplinary perspectives. Ultimately, it shows both the promise of democratic constitutions as a vehicle for social, economic and political change, and the variation in the actual constitutional experiences of different countries on the ground – or the limits to constitutions as a locus for broader social change. This book introduces students to a number of critical legal perspectives and demonstrates how such perspectives might be used to influence and reimagine existing legal doctrines. It extends the seminal Feminist Judgments Project and adapts it specifically for the purpose of teaching critical legal thinking. Each chapter provides extracts and commentary on the prominent thinkers within the critical discipline before a leading critical scholar rewrites the judgment in the famous 2013 decision of the High Court of Australia, Monis v The Queen, informed and reimagined through this perspective. When Tim Carmody was appointed Chief Justice of Queensland by Premier Campbell Newman in 2014, he had been Chief Magistrate for only nine months. It proved to be the most controversial judicial appointment in Australia’s history. Carmody’s elevation plunged the Supreme Court and the legal profession into a bitter conflict with the government and with Carmody himself. How did he come to be appointed to such a significant position? What can we learn from this saga about the fragile relationships between politics and the courts? The Tim Carmody Affair places the full story of Carmody’s damaging and divisive tenure in context, and identifies key reforms that could prevent this kind of controversy in the future. When judges disagree, those in the minority write a dissenting opinion. This book considers the great dissents in Australian law. Their worth may derive from numerous factors. Through a diverse selection of memorable dissenting opinions, this book illuminates the topic of judicial disagreement more generally - not only through examples of instances when minority opinions have been distinctly valuable, but by drawing out a richer understanding of the attributes and circumstances which lead some dissents to become iconic, while so many lie forgotten. This book goes behind the scenes of government - drawing from interviews with over 45 government and judicial officials - to uncover the history, theory and practice of the Australian Solicitor-General. The analysis reveals a role that is of fundamental constitutional importance to ensuring both the legality and the integrity of government action, thus contributing to the achievement of rule of law ideals. This volume explores the relation between Islam and the state in Buddhist-majority Myanmar from both an empirical and a comparative perspective.It provides an informed response to contemporary issues facing the Muslim communities of Myanmar, furthering knowledge of the interaction between state institutions, government policies, and Muslim communities of the past and the present. The book provides scholarly insights into the politics of belonging for Muslims in Myanmar. This book is essential reading for scholars and students studying Islam in the region. This book considers the phenomenon of soft law employed by domestic public authorities. Lawyers have long understood that public authorities are able to issue certain communications in a way that causes them to be treated like law, even though they lack legislative force. Soft law succeeds as a regulatory tool because people tend to treat it as binding even though public authorities know that it is not. It follows that soft law’s ‘binding’ effects do not apply equally between the public authority and those to whom it is directed. Consequently, soft law is both highly effective as a means of regulation, and inherently risky for those who are regulated by it. This book departs from previous examinations of the regulatory effectiveness of soft law to examine the possible remedies which might follow a public authority breaching its own soft law. It considers judicial review remedies, modes of compensation which are not based upon a finding of invalidity, namely tort and equity, and ‘soft’ challenges outside the scope of the courts, such as through the Ombudsman or by seeking an ex gratia payment. This book focuses on Michel Foucault's late work on rights in order to address broader questions about the politics of rights in the contemporary era. As several commentators have observed, something quite remarkable happens in this late work. In his early career, Foucault had been a great critic of the liberal discourse of rights. Suddenly, from about 1976 onward, he makes increasing appeals to rights in his philosophical writings, political statements, interviews, and journalism. He not only defends their importance; he argues for rights new and as-yet-unrecognized. Does Foucault simply revise his former positions and endorse a liberal politics of rights? Ben Golder proposes an answer to this puzzle, which is that Foucault approaches rights in a spirit of creative and critical appropriation. This edited collection provided a realistic assessment of the achievements, frustrations and possibilities of native title, two decades since the enactment of the Native Title Act 1993 (Cth), and after the most significant High Court decision on native title in more than ten years, Akiba v Commonwealth, which confirmed the existence of commercial native title fishing rights. 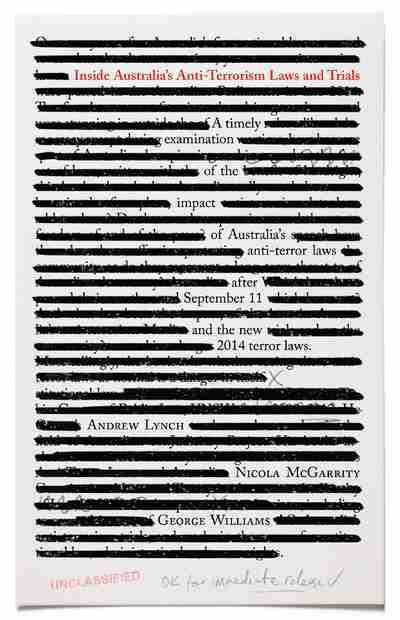 Over ten years after Australia’s first national laws were enacted to combat the threat of terrorism, yet more anti-terrorism laws were passed in the Australian Parliament in late 2014. This book asks whether Australia really needed to enact anti-terrorism laws in the first place, let alone add to them. 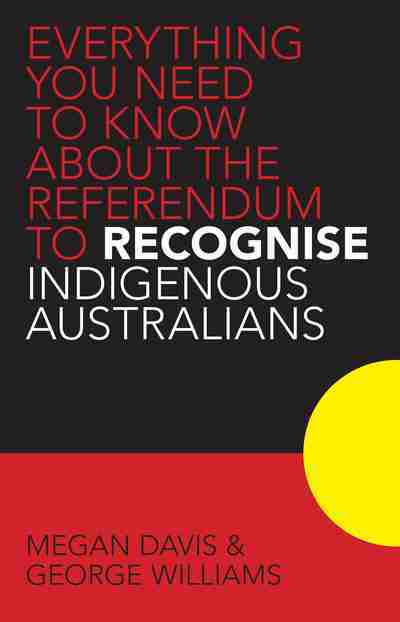 This book explains everything that Australians need to know about the proposal to recognise Aboriginal peoples in the Constitution. It details how our Constitution was drafted, and shows how Aboriginal peoples came to be excluded from the new political settlement. This publication s is an in-depth exploration of the relationship between decisions of the High Court and broader political currents in Australia and investigages the patterns and effects of constitutional invalidation and dissent on the High Court over time, and their correlation with political trends and attitudes. It also examines the role of constitutional amendment in expressing popular constitutional understandings in the Australian system. In its sixth edition, this publication has undergone a major rewrite. Every chapter has been reviewed and revised, with fresh choices made for cases and extracts to ensure that the book reflects the contemporary approach of the High Court and recent Australian and international scholarship. This publication looks at judicial review as an effective and appropriate way to regulate counter-terrorism measures. It brings together voices from all sides of the debate from a broad range of jurisdictions, from North America, Europe and Australasia. Comparative constitutional law is a field of increasing importance around the world, but much of the literature is focused on Europe, North America, and English-speaking jurisdictions. The importance of Asia for the broader field is demonstrated here in original contributions that look thematically at issues from a general perspective, with special attention on how they have been treated in East Asian jurisdictions. 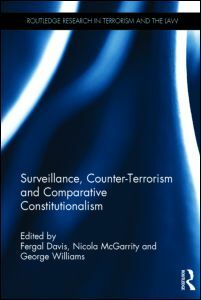 This book focuses on the issue of surveillance and the breadth of topics covered in this collection include: the growth and diversification of mechanisms of mass surveillance, the challenges that technological developments pose for constitutionalism, new actors in the surveillance state (such as local communities and private organisations), the use of surveillance material as evidence in court, and the effectiveness of constitutional and other forms of review of surveillance powers. This publication was shortlisted in the Tertiary (Wholly Australian): Scholarly Resource section of the Australian Educational Publishing Awards 2014) and deals with how the Australian Constitution protects human rights. It provides a comprehensive overview and analysis of the key public law principles, including the full range of express and implied rights in the Australian Constitution.